Manufacturing & Trading of solvent extraction plants and vegetable oil refinery. 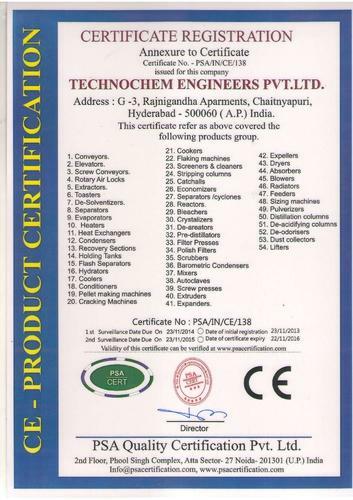 Established in the year 1994, we Technochem Engineers, are the celebrated manufacturer, supplier, and exporter of a vast line of solvent extraction plants and vegetable oil refinery. In addition to this efficient product range, we provide installation, up gradation, technical services, and engineering solution services. Our product collection consists of Solvent Extraction Plants, Oil Milling Plants, and Vegetable Oil Refining Plants. Since our inception, we have focused on providing the exact requirements of our valued customers by using the best possible raw materials, and following the industry standards and procedures. Our spacious infrastructure has supported us in coming up with a broad product range that is used by various industries. We have equipped our infrastructure with different machinery and equipment that provide us with small and large scale plants that produces supreme quality results. We have hired a team of professionals which is experienced and well trained to collect the basic requirements of our customers and to offer them the exact solutions to their problems. Our entire team is upgraded with information on the latest market trends by the several knowledge enhancing programs that we conduct from time to time. We never compromise with the quality that we provide and wish to continue fulfilling the diverse demands of our customers in the manner that we have been following from the very beginning of our establishment. We are a Private Limited Company under the able mentorship of Mr. Srinivas Vay, whose magnificent industry knowledge has helped us to achieve new heights in the industry. Our company is a reputed name among our customers and we aim to be their topmost priority in the future too. We are supported by a dexterous and assiduous team of employees, who work with complete dedication to provide best products and service to the clients. The team works passionately and enthusiastically to serve the clients with the best. The experts provide proper operational training to the clients at every level ranging from the installation of the plant to the usage. The proper analyzing, planning, designing, execution and checking of the range and services is done by the dexterous employees. 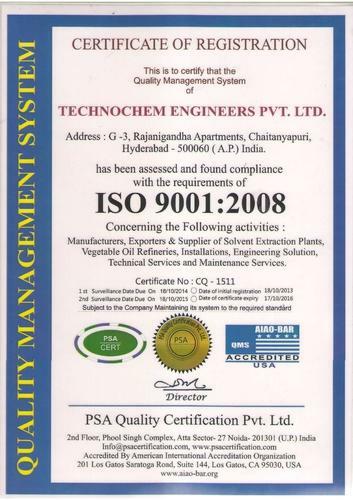 Technochem Engineers - ISO 9001 : 2008 Certificate. In such a short span of time, we have successfully outshines our name in the national as well as international market, due to our innovative and up graded technology as well efficient and effective range and timely execution of services, we are widely appreciated by the clients.